We’re all very excited and extremely proud of Steve after seeing the 2016 vintage of our Tempranillo Touriga take out another award yesterday! 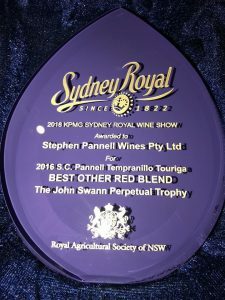 The wine that started as a dare in 2009 and has gone on to win trophies in the National, Melbourne, Alternative Variety and McLaren Vale wine shows has come up trumps once again at the 2018 Sydney Royal Wine Show winning The John Swann Perpetual Trophy for Best Other Red Blend. Whilst working at Hardys in the late 90’s Steve instigated a Portuguese grape variety program that included Tempranillo, Touriga Nacional and Tinta Cao, primarily for the production of fortified wine. However, it wasn’t till a chance conversation with a journalist friend regarding the future of Touriga Nacional as a table wine variety and an epiphany with a glass of Quinta do Valado in a Melbourne bar in 2009 that Steve decided on the blend that is today one of S.C.Pannell’s most recognised wines.